Best Buy sells home appliances, laptop and desktop computers, DVDs, tablets and hundreds of other products both in its stores and online. The store combined its reward card and financing system into one single program. According to Best Buy, shoppers receive easy financing terms that let them pay off the cost of their purchase in up to 24 months. When you read the fine print, you’ll see that the 24 month financing only applies to purchases on home theater products and HDTVs. You’ll also need to spend a minimum of $799 and pay for professional installation of those products in your home. If you make a purchase of $149 or more, you qualify for six months of financing. Purchases of $399 or more come with 12 months financing, and purchases of $599 or more come with 18 months financing. Best Buy offers two ways to purchase products and save money. If your order totals $149 or more, the company lets you select an interest-free option. As long as you pay off your purchase in six months or earlier, you’ll never pay a cent in interest. You can also opt for the rewards program, which gives you back five percent of your total purchase price. 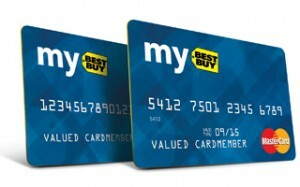 Best Buy also gives you 2.5 points for every dollar that you spend in the store and one point per dollar for purchases made in other stores. When you reach 250 points, the company sends you a rewards coupon in the mail. With 24/7 online account access, you can always remain on top of your credit card statements. Register your new card with the website, and select a user name and password for your account. You can then connect your card to your cell phone and email address, and you can even add someone to your account. The system lets you know how much you owe, your total balance, the latest purchases made on your card and your due date. You can also use the system to report a lost or stolen card. The Best Buy credit card comes with an array of credit limits. The amount you receive depends on your credit history and credit score. According to Credit Karma, 38 percent of all card holders have a credit line between $1,000 and $3,000 and just 17 percent of card holders have a credit limit of more than $3,000. Nearly 50 percent of all card holders have a credit limit of less than $1,000. The lowest available APR is more than 25 percent and those most customers will qualify for the default APR, which comes in at just under 30 percent. This high interest rate applies to purchases you make online through the official site, in your local store and purchases made at other stores. One of the largest issues with the high APR is that it can apply to purchases made under the interest-free financing terms. Best Buy may charge interest on your total purchase, even if you paid off most of that purchase before your terms ended. For example, you might buy an HDTV for $700 and pay off $650 of that amount when your term ends. The fine print on your financing agreement gives Best Buy the right to charge interest on the total $700 amount rather than the amount you still owe on your card. You can get big rewards and interest-free financing with a Best Buy credit card. If you open a new account, for best results, you should make sure you pay off the card each month.